MamaDeanoMusings: A catch up and a few Thinkings. A catch up and a few Thinkings. It seems I haven't written a blog post for about three months............I'm not entirely sure why, I think mostly it is due to the fact I have been reading a bit more. It's been great to have the mental energy to read again, and oil up those rusty brain cogs of mine, setting them in monition once more. I have been feeling like I'm ready to explore a bit more theology, and where the Christian practises I am part of originate from. In the past, I guess I have been a bit tentative about digging too deep, asking too many questions, as sometimes it's easier to listen to a leader at church, (who you are fairly certain isn't a total loony) and kind of go with what they think. Here is a whistle stop tour of a few 'thinkings' and things I have been reading lately. It's been very much in the forefront of the media, Christians everywhere are being forced to consider what they actually believe God says about LGBT marriage/relationships, I too have been trying to make some space in my head to consider this. This blog by Vicky Beeching, has been a great starting point for me, and has helped me to look into varying view points around the theology of sexuality. Another thing I think about a fair amount is suffering, God, prosperity, and how the three lie next to each other, This lady's blog has been another place to help me explore these things Tanya Marlow. Sometimes daring to question things can be tough, isolating and a bit scary. The book 'Found' by Micha Boyett has been on the top of my reading list. She explores the way Benedictine Monks pray, at intervals throughout the day, and uses that as a pattern for her daily prayer, in the midst of changing nappies, working and attempting to connect with God. It's like reading a book a friend has written. I identify with so much of what she writes. Thoughts of feeling like my life doesn't quite have the positive impact on the world and the needy as I hoped it would, and disappointment that my prayer life often resembles more of a mumble, or a 'tweet', rather than an intersession. Anyway, it's good, I would recommend it ! The energy fairy has definitely been kind to me in recent months. Despite currently writing this from the sofa, a bit too knackered to get out this morning, in general, I 'm doing really well. Getting out and about, picnics, camping trips and cooking a few meals here and there.....things are good ! 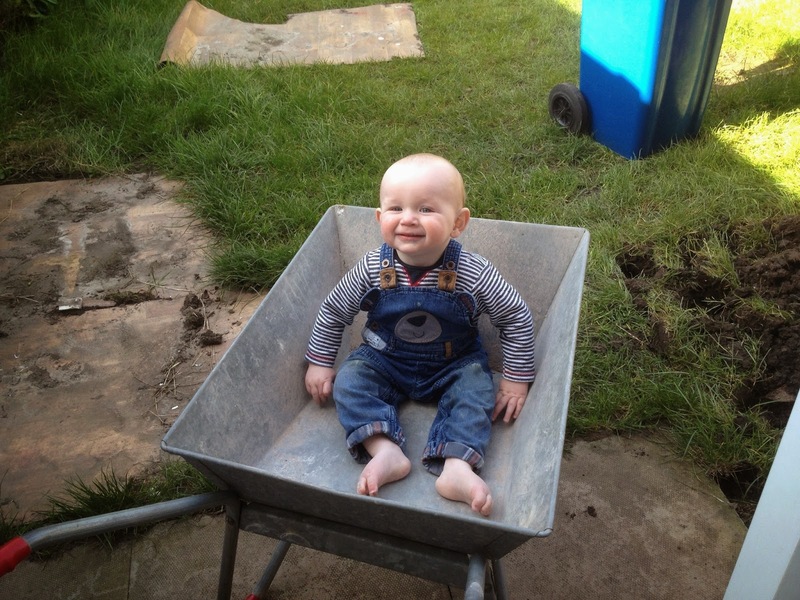 Here is the little one, in the wheelbarrow, 'helping' to mix the concrete for our patio. Bye for now, and hopefully I will be writing again soon !